When our editorial team first got together on a Skype chat to discuss the parameters for inclusion in the guide, the biggest question we faced was whether or not organic farming practices or certified organic going to a baseline criterion. In Slow Wine’s guide to Italian wines, organic farming isn’t a requirement for inclusion. There are myriad legacy wineries in Italy, with hundreds of years of winemaking between them. Many of those farms were founded long before the word “organic” referred to the farming practices as we know them today (this acceptation of the term entered the mainstream in the 1940s). To exclude estates that don’t rigorously adhere to an organic regimen would prompt the omission of some of Italy’s greatest winemakers, many of whom align — all agree — with the Slow Wine ethos. While winemaking traditions in Europe stretch back millennia, the arc of California’s viticultural history is relatively short in human terms. The arc of organic farming there is even shorter. Sonoma-based grower Phil Coturri, an organic and biodynamic pioneer (and possibly the first biodynamic grape farmer in California), didn’t plant his first biodynamic vineyard until the late 1990s. Another pioneer of organic farming in Napa Valley, Miljenko Grgich of Grgich Hills Estate (one of the top wineries in our new guide) didn’t release his first biodynamic wine until 2007. Randall Graham, one of California’s most vocal advocates for chemical-free viticulture in the state, didn’t pivot toward biodynamic farming until the early 2010s. Although nearly all of the wineries profiled in our new guide are organic farmers, it seemed overly restrictive to exclude growers who aren’t certified organic or certified biodynamic. Given the brief span of organic practices among California winemakers, too many would have been unfairly omitted. The other big hurdle we faced was what how to address the growing movement of négociant winemakers in California today. In recent years, there has been much talk of the “new California” and the state’s expanding number of nouvelle-vague winemakers who look to the European model for so-called “balance.” But many of those producers simply purchase fruit and oversee a team of enotechnicians who vinify and bottle the grapes for them. Some of the wines are fantastic but the success of the brands is often owed more to the celebrity of the “producer” or the marketing talents of the bottler. One of the guiding tenets of the Slow Food movement and the Slow Wine guide is, as editor-in-chief Giancarlo Gariglio put it in one of our prolix email exchanges, a connection to the land. As we hashed over our methodology, we decided early on that an overarching criterion would be the winemaker’s genuine bond with the land where her/his grapes are sourced. That didn’t mean that the producer needed to own the land where the grapes were grown. But it meant that there had to be a meaningful cohesion between the soil and the people who reap its fruit. Of course, another overarching yardstick for the guide was the quality of the wines themselves. 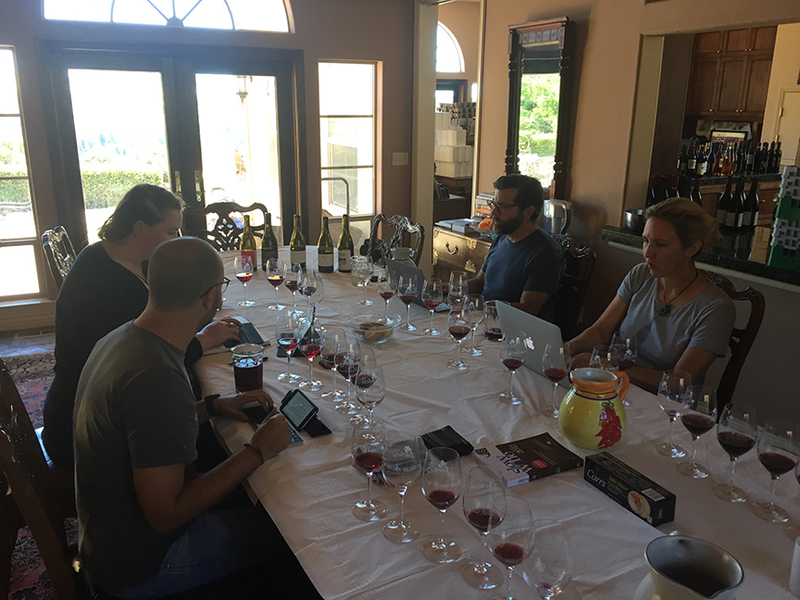 Our tasting panel, which included all five editors of the guide, based its evaluations on the standard eye-nose-mouth-finish paradigm. Among the wineries we contacted for samples, a few have a strict no sample policy. In those cases, representing just a handful of estates, our editors tasted in situ. What makes a winery and its wines “slow”? It’s certainly not just one of the above criteria but a confluence thereof. If there were any one element I could point to — and here, I’m speaking for myself and not for my fellow editors — it would be a the winemaker’s self-awareness that makes she or he stand out from the rest. In the process of creating our new guide, we defined the slow wine ethos as respect for the environment combined with a will to produce wines that express the places, people, and history of the land where they are grown, raised, and bottled. The best wines and wineries we tasted spoke to us in terms of their connection to the land, their quality, value, and originality. To my mind, they were all wines and wineries that seemed conscious of their purpose, knowing of their reason for being. Some might be surprised by the wineries we didn’t include this time around. But to borrow a phrase, de gustibus aut bene, aut nihil.